This article is continuation of the examination of What Is In A Name and how the use of the nomenclature Sub-Saharan obscures biblically the identity of Blacks in the bible. In my minor research of this topic I begin looking more into the DNA aspect of it and I unequivocally state at this point that I am not a DNA specialist, but I do have the ability to engage in deductive reasoning once gaining a basic foundation in the subject. In my Extended Introduction I referenced a young man who approached the identification of Israel amongst people of the African diaspora slave trade through Y-dna haplogroup. Through his research he determined that Y-DNA haplogroup E1b1a was the Y-DNA of Israel through their father Jacob and that his twin brother Esau as a separate nation is/was E1b1b. However, he is of the view that for him the Most High defaulted him to E1b1b a Hamitic haplogroup. Before moving forward it is necessary to get a working definition of Y-DNA haplogroup. DNA is basically genetic coding. Y-dna is the paternal dna passed from father to son. I will leave it up to the reader if they want more exacting information as the scientific verbiage can be rather long. According to Wiki, a haplogroup is a combination of alleles at different chromosome regions that are closely linked and tend to be inherited together. It is a group of individual organisms which share a common ancestor. For example, y-dna E would be the haplogroup of E1b1a which is a descendant of E. Within each haplogroup can be sub-clades or subgroups of the major haplogroup which if the reader reviews the charts below will see that represented in the E1b1b haplogroup in populations of Egypt and North Africa. I have provided Y-dna charts of Africa, Europe, South Asia and Central Asia with pictures below so that one can have a visual of points I make in this article. My reason for examining the dna side of the Israel Of Ultimate Dispersal is because one day I saw a woman who was clearly from Africa, but not of the usual Africans I see. She seemed Sudanese of some sort and it had me wondering if she was really the same as Black Americans. Upon further thought and looking up the y-dna from where it appeared she was from, I came to the conclusion that E1b1b was not Hamitic but of Edom or Esau entirely. Given that haplogroup A and B exist in populations such as the Dinka, Khoisan, Nuba and so forth but have little or no representation in the Bantu groups who test largely for E1b1a it is reasonable that they are representative of the true Hamites. If one looks at the chart for North Africa and Egypt and Ethiopia they will see E1b1b and it's subclades highly represented in the population groups. For instance, E1b1b has a high representation in the Oromo of Ethiopia and the Somali. The Amhara show Japhetic or Asian representation at a fairly high percentage for the sample taken. The Somalis show some Japhetic representation but are highly Edomite. They have Asiatic or Japhetic mtdna M1 in addition to L1and 2 no L3e. E1b1b also has high occurrence in the populations of Europe which bolster my assertion that the Edomites mixed with the Japhetic races including the Askenazi Jews and lost phenotype eventually. There is noticeably no E1b1a in the populations of Europe sampled though that may change in the future as more Black males have children with European women and those children potentially marry into the Japhetic (white) race. When one looks at the European chart they see an assortment of alphabets. The J haplogroup is a popular one in Europe as is R1a and R1b. All of these haplogroups except R1b are present in the Askenazi Jewish sample. Ironically, I believe it is the J haplogroup that they like to associate with the Middle East bearing in mind that doesn't necessarily mean Israel. Again in antiquity there was no Middle East terminology. When one examines the chart of India and Central Asia he will see the haplogroups of Europe represented in India or South Asia and Central Asia. Amazingly, India and Central Asia has a lot alphabet haplogroups compared to the ones considered native to Africa. The Egyptian chart reveal that modern Egyptians have the same Edomite representation of E1b1b as well as a bit of the original Hamitic A/B group with the Japhetic haplogroups of J, G, T and some R. In a nutshell Europe is dominated by the same y-dna haplogroups of India and Central Asia as well as in Saudi Arabia. The only difference is some of these groups exhibit albinism and others still have some melanin or are mulattoes from mixture with native Black or melanated populations. During the Trans-Atlantic slave trade it is without question that the majority of people taken to America, the Caribbean and Latin America were of the E1b1a y-dna. But there were also some Hamites and other Shemitic people taken as well. This is seen in a sampling of Haitian people. What is intriguing is that I do not believe any E1b1b or Edomites were captured or sold. They more than likely participated in the selling along with some Hamites and Ismaelite Islamic tribes. On the female side, it is said the majority of women were of mtdna L3e. This mtdna is not present in the North African Edomite Berber groups as they married mostly European or Japhetic women. It also suggest that the Bantus' were the truly endogamous group on the continent either a throwback to their Israelite roots or just cultural cleaving among strange and hostile groups of people. It is suggested that E1b1a originated in northeast Africa as with E1b1b, but I read somewhere that in antiquity Israel today would have been northeast Africa. This makes sense as it was a Hamitic land with the original people there being Canaanites before the Israelites usurped them in the land. Therefore, in keeping with Biblical testimony Jacob (E1b1a ) and Esau (E1b1b) had their origins in Canaan northeast Africa and they seemed to run into each other all through their lives and not without hostility. When Israel was exiled in 70ad Esau descendants were wherever they went and lived on in true irony in the sons of Japheth who now dwells in the tent of Shem with the blood of Edom coursing through some of their veins. 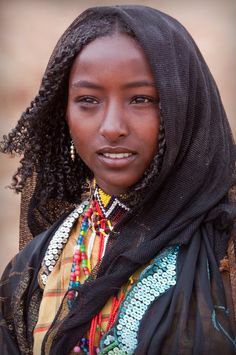 Image of Oromo girl. Note the reddish-brown sorrel color. Thank you Jimmy KI. I hope life is finding you well.